Why Did America Switch Sides? [Obama] partners with jihadists and Nazis and has waged war against seven nations. The U.S. “switched sides” to arm and support Al Qaeda in Libya, so they would topple Gaddaffi. This misguided effort actually created a terrorist safe haven in Libya. The same thing happened in Syria. The Syrian rebels are mainly Al Qaeda, and the U.S. has been supporting these terrorists for years. Indeed, as reported in the Wall Street Journal, the National and other sources, Al Qaeda’s power within the Syrian rebel forces is only growing stronger. And they’ve persecuted, brutally murdered – and even crucified – Christians. Reuters noted in February 2012 that al-Zawahri is backing the Syrian rebels, and asking his followers to fight the Syrian government. But al-Zawahri has since taken control of the main Al Qaeda rebel terrorist group in Syria: al-Nusra. In doing so, Zawahiri was trying to assert control over two of al-Qaeda’s most virulent affiliates. AQI had mounted a series of spectacular attacks in Iraq over the past year, demonstrating that it was a force to be reckoned with. According to the Congressional Research Service, there were some dozen days in 2012 in which AQI carried out simultaneous multicity attacks that killed hundreds of Iraqis. And the al-Qaeda affiliate in Syria is widely acknowledged as the most effective fighting force in the war against Bashar al-Assad’s regime. But we are supporting these murderers. Indeed, Obama signed a special exemption to the law barring arming of terrorists. 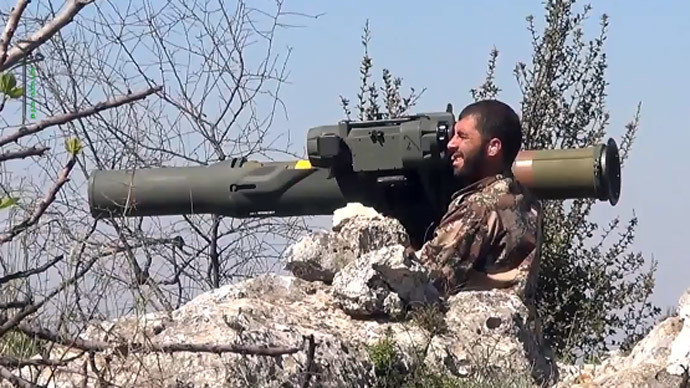 Screenshot from Youtube video showing Syrian rebel using a TOW provided by the U.S.
Let’s recap … Most of the Syrian “rebels” are Al Qaeda. The U.S. government has designated these guys as terrorists. Things are getting worse, not better: Al Qaeda is gaining more and more power among the rebels. The U.S., Saudi Arabia, Qatar and Israel have been backing these guys for years. Indeed, we’ve long known that most of the weapons we’re shipping to Syria are ending up in the hands of Al Qaeda. And they apparently have chemical weapons. The U.S. is backing neo-Nazis in Ukraine (and see this). These savages have already committed mass murder in broad daylight … on camera while being filmed. As resistance to Kiev’s right-wing regime expanded in the ethnic Russian east and south, the coup regime found itself unable to count on regular Ukrainian troops to fire on civilians. Thus, its national security chief Andriy Parubiy, himself a neo-Nazi, turned to the intensely motivated neo-Nazi shock troops who had been battle-tested during the coup. These extremists were reorganized as special units of the National Guard and dispatched to the east and south to do the dirty work that the regular Ukrainian military was unwilling to do. Many of these extreme Ukrainian nationalists lionize World War II Nazi collaborator Stepan Bandera and – like Bandera – dream of a racially pure Ukraine, free of Jews, ethnic Russians and other “inferior” beings. The slur of calling the Odessa protesters Colorado beetles — as they were being burned alive — was a reference to the black-and-red colors used by the ethnic Russian resistance in the east. The neo-Nazis – under the control of Parubiy and the other Nazi-wannabes in the new Ukrainian government – have now twice committed mass murder by setting fire to buildings where Russian speakers were trying to take cover. In Ukraine, a grisly new strategy – bringing in neo-Nazi paramilitary forces to set fire to occupied buildings in the country’s rebellious southeast – appears to be emerging as a favored tactic as the coup-installed regime in Kiev seeks to put down resistance from ethnic Russians and other opponents. Other representative incidents include the Kiev-appointed governor of the Southern Ukraine region of Kheron praising Hitler as a liberator – and neo-Nazis harassing Russian World War II veterans as they sat on a bus – all on Russia’s annual day of celebrating victory over the Nazis. The [New York] Times added … Residents who had gathered around the police station offered an account that differed from the interior minister’s. The city police, they said, were sympathetic to the pro-Russian side and had mutinied against an out-of-town chief newly installed by the interim government in Kiev. “Armored vehicles had driven into the city to confront the rebellious police…. In other words, the new Ukrainian government is sending in neo-Nazi brigades to do the hatchet work that the local police refuse to carry out. The Ukrainian neo-Nazis are also supporting Islamic terrorists. And yet the U.S. is heavily supporting these thugs. Once again, America has switched sides … from fighting Nazis in World War II to backing them today. Why Are We Backing the Bad Guys More than the Good Guys? True, our government has backed Islamic terrorists and Nazis before. But it has now gotten so out of hand that we seem to be backing the bad guys much more than the good guys. Though many Americans don’t want to believe that their government would collaborate with neo-Nazis or other extremist elements, there actually has been a long history of just that. In Central American conflicts that I covered for the Associated Press and Newsweek in the 1980s, some of the “death squads” associated with pro-U.S. regimes were drawn from neo-fascist movements allied with the far-right World Anti-Communist League. Thus, most Americans weren’t sure what to make of recurring reports about right-wing “death squads” killing priests and nuns and committing other massacres across Central America. So, it should come as no surprise that the Kiev regime would turn to its Maidan “self-defense” forces – formed around neo-Nazi militias – to go into southern and eastern Ukraine with the purpose of burning to death ethnic Russian “insects” occupying buildings. The key is not to let the American people in on the secret.